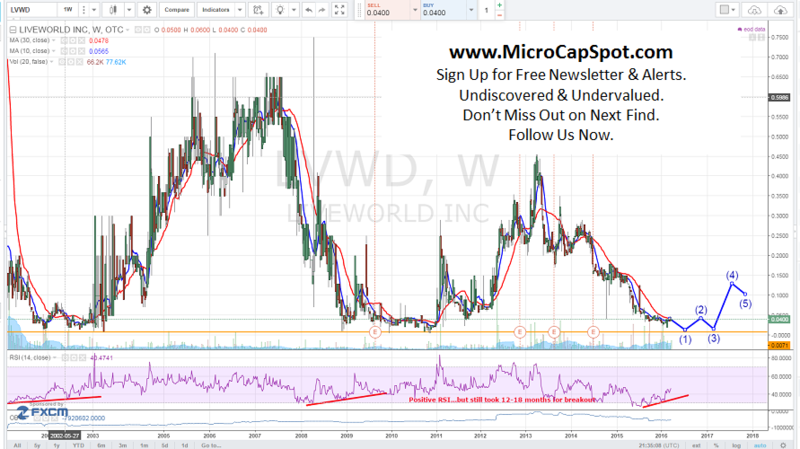 LiveWorld, Inc. (OTCMKTS:LVWD) stock maybe showing signs of being close to a bottom. LVWD has $0.10 cash per share on its balance sheet. The stock has been declining over the last 3 years from $0.49 all the way down to its current levels of $0.04. Volume traded heavily today with over 315,000 shares trading hands which is almost 10 times its daily average volume. In recent developments, LiveWorld, Inc. (OTCMKTS:LVWD) released its fourth quarter financial results. Revenues declined from $3.9 million in the same period 2014 to $2.6 million. Full year revenue was $9.9 million compared to $13.8 million in 2014. The company did post positive net income of $249k (9% of revenues for the quarter). LVWD ended the quarter with $3.5 million which is equivalent to $0.10 cash per share which is more than double its current trading value. We can expect cash to decrease as the LVWD makes continual investment into the development of its software and increases sale support. Revenues may continue to trend down and so will profitability as the expenditures will put downward pressure on earnings in the short-term. If those investments pay off, they should begin to produce revenues that hit the bottom line. Technically speaking, the stock will likely visit its long-term support at $0.007 where it has bottomed several times before during past declines similar to the current one. If and when it hits those levels, it would not be surprising to see an epic rally where the stock gains 100% – 300% in short order. The company needs to improve revenues and show profitability before the stock will breakout to above the $0.10 area. LiveWorld is a services and software company that enables brands to enhance the customer experience in social media. Our solutions empower the largest brands in the world, allowing them to develop deeper relationships with their customers in the areas of marketing, customer service, and insights. LiveWorld clients foster social media environments that are natural continuations of the experiences customers have with brands—and with each other—in the real world. LVWD is currently trading at a $1.5 million market valuation. The company is gaining momentum as it ramps up production and its market share continues to grow. States are beginning to see the value of the technology at no cost to them since the DUI violator will pay for the cost. If the company reaches 10,000 units, LVWD should be making roughly $12 million annually (almost equivalent its market cap). We will be updating on LVWD when more details emerge so make sure you are subscribed to Microcapspot so you know what’s going on with LVWD. Disclosure: we hold no position in LVWD either long or short at the publication of this article and we have not been compensated for this article.